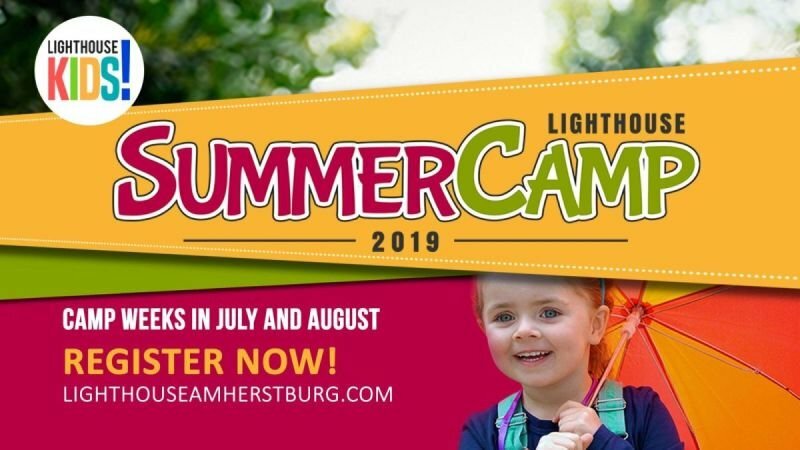 Kids' Summer Day Camp - Lighthouse Church, Amherstburg, Ontario. Partial weeks are the 1st week of July and August. First 2 children in a family are $60/each, the third child is 1/2 price ($30); fourth and any other children in the IMMEDIATE family are free. Early drop off (8am) & late pick up (5pm) are available for $8/day/child or $15/day/family for either or both. Payment for early/late is due the week of camp as we understand the need cannot always be determined early. Any week except the first week of July and August. First 2 children in a family are $75/each, the third child is 1/2 price ($40); fourth and any other children in the IMMEDIATE family are free. Early drop off (8am) & late pick up (5pm) are available for $8/day/child or $15/day/family for either or both. Payment for early/late is due the week of camp as we understand the need cannot always be determined early. REGISTRATION IS NOW OPEN. Please click HERE TO REGISTER now. A registration form must be completed for each child. PLEASE only click on "TICKETS" section if you wish to PAY FOR CAMP VIA PAYPAL ON OUR SITE. OTHER OPTIONS FOR PAYMENT ARE LISTED BELOW. PLEASE NOTE: To receive EARLY REGISTRATION rates, registration and payment must be received by June 15th, 2019. Registration is not guaranteed until payment is received. There are a variety of payment methods available: PAYPAL via this web page; CHEQUE mailed to LIGHTHOUSE CHURCH, 266 King St., Amherstburg, ON N9V4C6; OR in person via credit card, debit by appointment (email lhkids1@hotmail.com to set up time). All children beginning JK in September to grade 6 are welcome. Students in grade 7 & 8 may register as a "Leader in Training". Children registering for "Leader in Training" are considered campers and as such will receive all benefits of camp (activities, field trips, tshirts, hot lunches, snacks, etc.). Leaders in Training will receive special pre camp leadership training and leadership opportunities throughout the camp week. Cost for "Leader in Training" stream is the same as for regular campers. A limited number of opportunities exist each week of camp. High School students interested in volunteering at camp for Community Hours (lots of fun and great experience), may apply by clicking HERE.